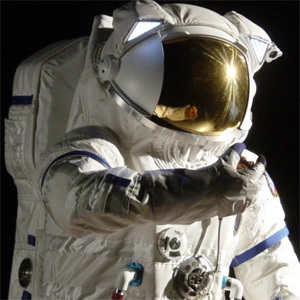 A children's guide to astronaut spacesuits, ideal research for space projects or homework! Why does an astronaut wear a spacesuit? Space is a very challenging place to explore. There is no air in space, so there is nothing to breathe. It is very cold, unless the sun is shining onto you - and then, without air to protect you, the rays of the sun would soon burn you! To survive in space you need a suit that protects your body from the heat and cold, and surrounds you with air to breathe. Space suits are pressurised, meaning they are full of air to support your body, which is why they look puffed up. A space suit is like a tiny spaceship for one. It is a very complicated machine, with air conditioning, heating, air to breathe and water to drink. It even has a built in toilet! 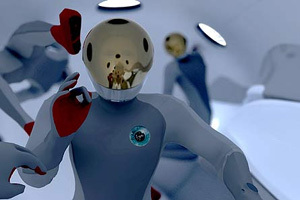 Some space suits attach to a rocket powered backpack, which allows the astronaut wearing it to fly around in space. 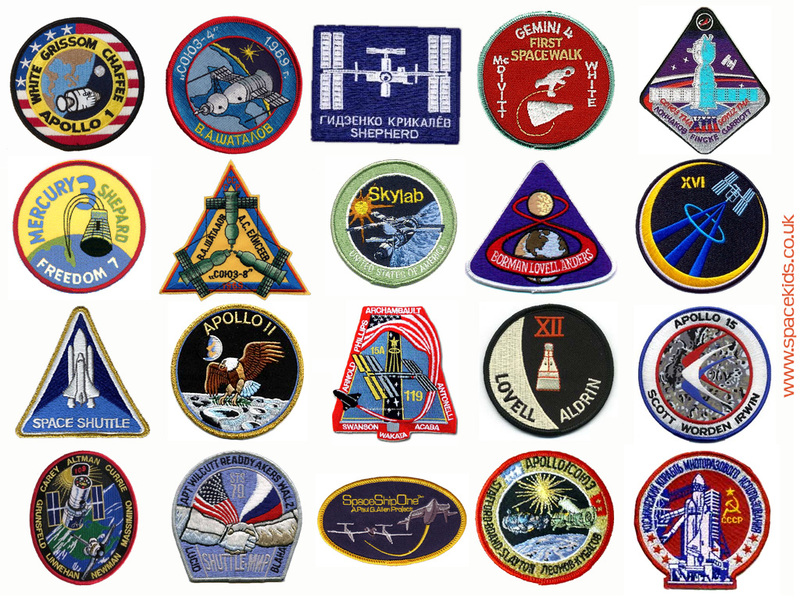 Astronaut crews usually have a mission patch sewn onto their space suits. Sometimes the patch is designed by one of the astronaut crew. Patches usually have a picture related to the mission or the spacecraft they are flying on, and they often have the crew's names on them too. The Apollo 11 patch shown above is from the first mission to the moon - the lunar module spacecraft that landed on the moon was named Eagle. See lots more patches by clicking here. Spacesuits were first invented around 80 years ago, for early pilots who wanted to fly really high. As pilots fly higher and higher, the air becomes thinner, so they need air to breathe and to support their bodies. The earliest suits were made of rubber and cloth and were stiff, bulky and hard to move around in. In the 1950s and 1960s, Russia and America got into a race to be the first into space. Although the earliest astronauts stayed inside their spacecraft, scientists knew they needed protection, and so started work on better space suits for these missions. The first NASA spacesuits were silver in colour, because scientists thought this would reflect the burning hot sun rays. They had hoses on them that were attached to machines that kept them supplied with air and cooling water. 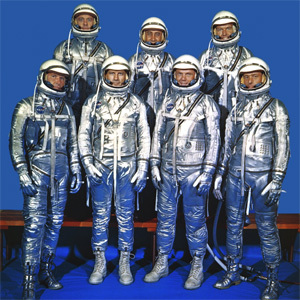 The picture on the left shows the first seven NASA astronauts, selected from the best Airforce test pilots, to fly on the Mercury space missions that put the first Americans into space. 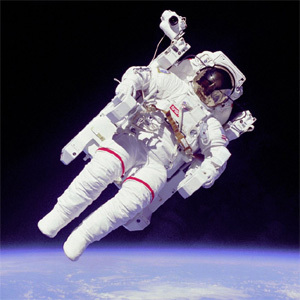 Space suits were originally developed for Airforce pilots. In the 1950s planes were designed to fly higher and faster than ever before. 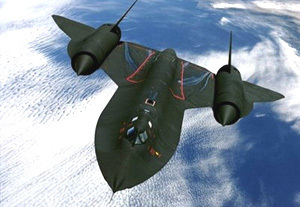 These top-secret spyplanes flew so high they were almost in space! The modern orange ESS space suit that Spaceshuttle pilots wear today was invented for pilots of the incredible Blackbird spyplane you see here. Blackbird can fly faster than a bullet coming out of a gun, and goes through the air so fast that its windscreen heats up to over 200 degrees centigrade - much hotter than boiling water. No wonder its pilots needed to wear a special suit! 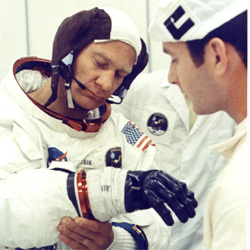 As space missions became more and more ambitious, so suits had to become stronger, and better. 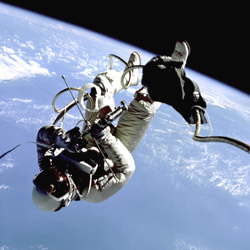 During the NASA Gemini missions, the suit was improved to allow astronauts to open the spacecraft and go outside. They were attached to the spacecraft by a thick tube that carried air and water, and stopped them floating away! 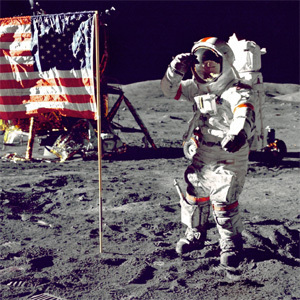 Then during the Apollo missions, the suit had to be redesigned again, to allow astronauts to get out of their space ship and explore the surface of the Moon. The suit you see here is an Apollo space suit. It has a big backpack containing enough air, water and batteries to allow the astronaut to explore the moon for a whole eight hours, without being attached to their space craft for all that time! The suit even has a rather unpleasant tube built into it to allow the astronaut to go to the toilet - after all they couldn't take the suit off and go to the toilet when they were out on the moon's surface! This space suit is attached to a rocket powered backpack called a Manned Maneuvering Unit (or MMU for short). This suit has 24 tiny rocket motors, that allows the astronaut to fly freely around in space without being attached to the space craft at all. 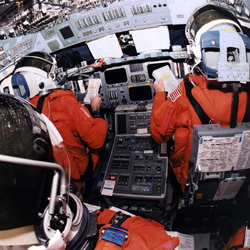 There is a camera attached above the astronauts head so other crew members and scientists on earth can see what the astronaut is seeing, and the controls for flying the MMU are on the ends of armrests. Working outside of a space craft is sometimes called EVA, or Extra Vehicular activity. The MMU was designed make working on satellites easier. The pilot using this MMU is called Bruce McCandless, the astronaut who helped develop the MMU. Nowadays astronauts don't need to wear space suits at all most of the time. 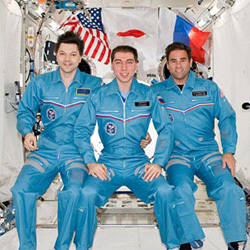 When they are travelling in a Space Shuttle, or visiting the International Space station, they wear simple blue overalls, or even their own clothes. They do still wear the familiar white suits if they need to go out into space to fix a satellite or do experiments. 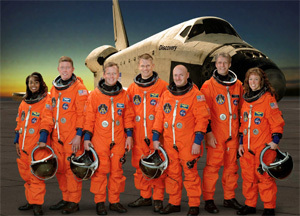 The most commonly seen space suit these days is the orange ESS space Shuttle suit. It is worn during takeoff and landing, to protect the crew if there is a problem with the air in the shuttle itself. The suit is orange so that if the crew has to parachute out of the spacecraft in an emergency they will be easier for rescue crews to spot. When they are in space, astronauts usually wear simple overalls, not a space suit. Nowadays, astronauts living in the ISS International Space Station often wear their own clothes in space, so they may spend their time in space wearing shorts and a t-shirt! A space suit is very complicated to put on and wear. 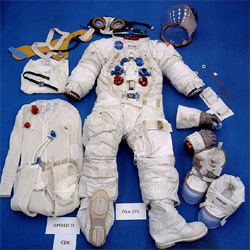 This picture shows all the parts of an Apollo space suit, as worn by the men that landed on the moon. Astronauts take over an hour to put on a space suit, and they need a helper to put on all the different bits in the right order!. At launch time, astronauts wear their suits and helmets, making the cramped cockpit even smaller! The helmets have two visors, a clear one that seals the suit up to keep the air inside, and a dark one to protect their eyes from the extra bright sunshine in space. What's in a space suit? 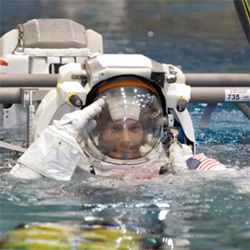 Astronauts learn how to move around in space in their spacesuits by training in a big swimming pool. In the pool they pretend to do the things they will do on their mission. Being underwater feels a lot like being in space, because you float! Under their helmets, astronauts wear a hat that NASA have nicknamed a "Snoopy cap". It holds their radio microphone and speakers so they can talk to each other. In this picture you can also see the stiff rubber gloves that screw onto the suits. Although they are stiff and bulky, with practice astronauts can learn to do very complicated and difficult jobs while wearing their spacesuits. Sometimes astronauts go outside to repair their spacecraft, or a broken satellite. What will spacesuits look like in the future? In the future, you will be able to go into space for a holiday! Scientists are working on smaller, lighter, more comfortable space suits, that will be easier to put on and wear. These suits may be tighter fitting, made mostly of fabric, with less metal and rubber bits, and should make movement and even working in space easier to manage. They may look a bit like the artists impression shown on the left.